Over the past decade, the increasing availability of zirconium-89 has fueled a rise in the development and use of targeted positron emission tomography (PET) probes with relatively long serum half-lives, particularly radiolabeled antibodies. 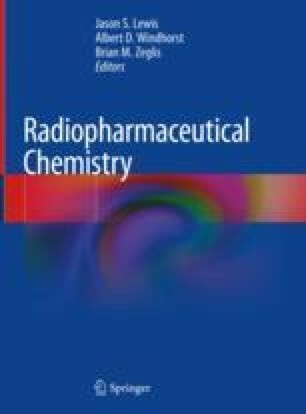 The stable coordination of 89Zr in radiopharmaceuticals is of critical importance to prevent its in vivo release and subsequent non-specific accumulation in nontarget organs, especially the bone. To date, the only chelator for 89Zr to be used in the clinic is the siderophore-derived desferrioxamine (DFO), though concerns persist regarding the in vivo stability of the [89Zr]Zr-DFO complex. In recent years, research into the development of alternative, more stable chelators for 89Zr has flourished. This chapter provides a general overview of zirconium-89, specifically its chemical properties, production, radiochemistry, and biomedical applications. Several examples of new chelators for 89Zr are discussed along with their strengths and weaknesses compared to DFO. Finally, a brief exploration of the future of 89Zr radiochemistry is included to provide the reader with awareness of the most recent progress in the field as well as what this relatively new positron-emitting radionuclide can offer going forward.